At last night's Na Hoku Hanohano Awards, Willie K joined the small group of local recording artists who have won Hokus as members of three different acts or entities. He skipped the awards ceremony at the Hawai'i Convention Center, but won the Contemporary Hawaiian Album with "Barefoot Natives," his album with Eric Gilliom. Willie has multiple prior wins as a solo artist and for his work with ex-girlfriend* Amy Hanaiali'i Gilliom. Amy Gilliom also had a big night. Her album, "Generation Hawai'i," won in four categories including Album of the Year and Female Vocalist of the Year. The group Kaukahi's debut album, "Life In These Islands," received three Hokus including Group of the Year. WILLIE K didn't attend the 2007 Hoku Awards last night, but the mega-talented entertainer made history anyway. When "Barefoot Natives," his album with Eric Gilliom, won Contemporary Hawaiian Album, Willie became one of the very few local recording artists with Hoku wins as a member of three different acts. Willie adds his win as a member of Barefoot Natives to his previous wins as a solo artist and for his recordings with former partner Amy Hanaiali'i Gilliom. (He joins the other artists who have done this: Led Kaapana, Henry Kapono Kaaihui, Cyril Pahinui, Israel Kamakawiwo'ole and Jake Shimabukuro). Willie's ex-girlfriend* had far more reason to celebrate as "Generation Hawai'i" came away with four awards -- Album of the Year, Hawaiian Album of the Year, Female Vocalist of the Year, and Engineering, the latter going to studio engineers Ron Pendragon and Michael Ruff. It was the fifth time since 1998 that Amy has won either Female Vocalist when billed as a solo artist or Group of the Year when billed as a duo with Willie. It was also a big night at the Hawai'i Convention Center for members of Kaukahi, as their album, "Life in These Islands," won them Group of the Year honors, and also earned album art designers Dalen Kahiapo and Todd Schlosser an award in the Graphics category. The quartet had more reasons to celebrate as band member Kawika Kahiapo won Song of the Year, a composer's award, for the album's title song, and also received the Ki Ho'alu Award from the Hawaii Association of Recording Artists. "It's really about continuing to perpetuate the art of slack key," Kahiapo said. "Hawaiian music in recent years has been overshadowed by other styles so to be able to continue to perpetuate slack key and take it out of Hawaii is about sharing and getting it out." Nathan Aweau won Male Vocalist for the second year in a row, and for the third time in the last five years. It was also business as usual for Jake Shimabukuro, who won Instrumental Album for the fourth time in five years, and for album annotators Puakea Nogelmeier, Fred Krauss and Keali'i Reichel. The trio celebrated their second consecutive win in Liner Notes, when Reichel's Christmas album, "Maluhia," won in that category. Reichel also won Favorite Entertainer, the only award determined by public vote; it was his fourth win in that category. "Liner notes are the doorway to the meaning of the music, so I see them as a reference text. That's why we invest as much as we do in them," Nogelmeier said after accepting the award for the three of them. Na Kama's album, "Kamakolu," won in the adjudicated Hawaiian Language Performance category. "Ni'ihau," written by Pekelo Cosma and Ileialoha Beniamina, and recorded by Cosma on his "Hana by the Sea" album, was adjudicated the winner in the Haku Mele category. "The Wild Hawaiian," Henry Kapono Kaaihue's imaginative album of traditional Hawaiian songs sung in Hawaiian but recorded as mainstream rock, won Rock Album. New ideas were also heard and encouraged as Paula Fuga prevailed in the Most Promising Artist(s) category. 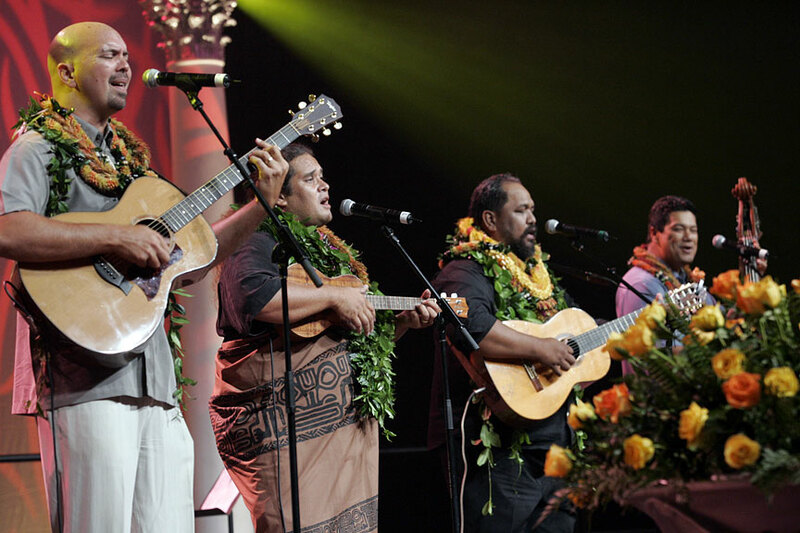 The Makaha Sons won the newly created award for Music Video DVD. Moon Kauakahi accepted the award on behalf of the group, saying: "I was prepared to give away an award, but not to receive one, but this is exciting because it's the first time this award has been in the Hokus." » Entertainer Amy Hanaiali'i Gilliom is a former girlfriend of singer Willie K. She was incorrectly referred to as his ex-wife on Pages A1 and A6 yesterday.